PEARL, MS - The Mississippi Braves will be holding a Job Fair on Saturday, Feb. 9 to fill part-time game day positions for the 2019 season. The fair will take place from 10 am-3 pm in the Farm Bureau Grill at Trustmark Park. Interviews may be conducted that day for seasonal, part-time positions. 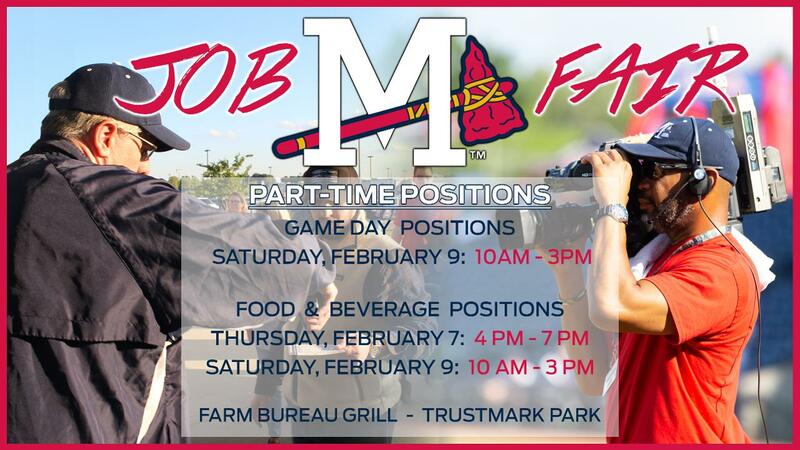 The Mississippi Braves Food and Beverage Department will be hosting an additional Job Fair on Thursday, Feb. 7 from 4 pm-7 pm in the Farm Bureau Grill, aiming to fill a number of seasonal, part-time concession positions. Applicants should be energetic, friendly and dependable, and look forward to contributing to the welcoming atmosphere of Trustmark Park. Those interested in a position with the M-Braves can see a listing of jobs below, and applicants are encouraged to complete the application form prior to the Job Fair. Stop by the M-Braves Front Office located at Trustmark Park to fill out an application. All applicants are required to attend the M-Braves Job Fair. All applicants must be at least 16 years of age and able to work nights, weekends and some holidays. You must apply in person as online applications/resumes are not accepted. We accept applications from 9:00 am to 4:30 pm Monday - Friday only. For more information, call 888-BRAVES4 or 601-932-8788. Based in Pearl, MS since 2005, the Mississippi Braves are the Double-A Southern League affiliate of the Atlanta Braves. The M-Braves are owned and operated by the Atlanta Braves, the longest continuously operated franchise in Major League Baseball. Follow the M-Braves at www.mississippibraves.com, facebook.com/mbraves, and twitter.com/mbraves.